Records show that Grewelthorpe had a small Methodist Society of 11 members in 1795 which came into being as a result of the visits by John Wesley to this locality. The head of the circuit was at Middleham with a Minister at Tanfield. When it is remembered that membership with the Wesleyan Society, in those days, may have caused considerable opposition from relatives and friends for many, and required for all a much stricter course of living than is today associated with a religious vocation, it is remarkable to find the numbers who were enrolled in the small villages in the circuit.Grewelthorpe members felt the need of a Preaching House, so in 1803 they bought some land at a cost of £8-8s-0d in “lawful English money” as the deed states.A small chapel [30 feet x 24 feet including walls] was built after the style of Methodist Meeting Houses of the day. It was square with a gallery and arched windows which were later placed in the vestry of the second chapel as seen today.We have no record of the cost of this building, but its erection meant great sacrifice on the part of those first members. The list of trustees in 1803. John Jackson: Thomas Blackburn: John Blackburn: Leonard Leathley & Edward Mann. The work prospered and Methodism became established in the village. Plans were laid for an enlarged building and the old preaching house would be demolished. The new chapel would be a large impressive building much bigger than any in the surrounding villages. Services were held in 2 cottages whilst the work progressed. The trustees in 1860 were. Thomas Tomlin: William Rennison: William Coldbeck: James Graham: William Richmond: Thomas Sadler: Henry Lofthouse:Charles Lofthouse : Peter Lofthouse: John Banks Lee: Edwin Grange & Richard Atkinson: These trustees decided they needed some sort of plan. Of course planning permission was unheard of in those days. They would like a chapel with a gallery all round, this was a very popular style for non-conformist chapels in towns at that time. The only chapel of this type was the Wesleyan Chapel on Coltsgate Hill in Ripon. Allhallowgate and Masham chapels were built much later.Henry Lofthouse said he knew an architect who could draw the plans. So it was left in his capable hands. Henry’s man must have had a thing about Church of England architecture to make him incorporate Gothic arches in the roof and pointed arch windows. To accomodate the pointed arch in the roof the pitch had to be very steep. The Parish Church at Grewelthorpe has a roof of exactly the same pitch but as there is no gallery it is in proportion. So the trustees ended up with a church of England roof on a 19th century Nonconformist Chapel inerior. An architectural hybrid. It is possibly unique. The building work began. as it got higher and higher people all around the district heard about this remarkable structure, and many came to marvel at it. All went well until the roof was constructed. The gable ends had been built. All was ready to be slated. Then a terrific gale occurred, the worst in living memory. It demolished part of the West Gable and blew down the Principals and caused great havoc. Critics said they should give up trying to build this great high place. The disaster might be a sign of God’s disapproval. “Remember the Tower of Babel” they said. “and if you do complete it, without a doubt it will blow down in the first gale and kill everyone inside.” But Henry Lofthouse and his colleagues were not deterred. They battled on and eventually the chapel was finished at a cost of about £500, a lot of money in those days. The opening ceremony was now planned. As it was such an extraordinary building it was felt they should have an extraordinary man to open it, and such a man was The Rev.Peter MacKenzie from Gateshead. He was a famous Victorian preacher, a man of outstanding ability. Rather eccentric in many ways. It was said that in order to demonstrate how easy it is to fall from grace into the depths of Hell, he leapt in a dramatic manner from his high pulpit and slid down the handrail at great speed into the body of the chapel. 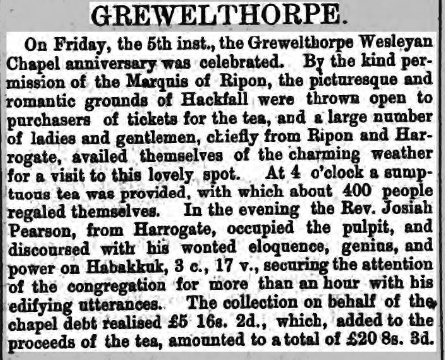 To continue his sermon from there.The following notice was placed in the Bedale & Northallerton Times February 1866. This chapel will be opened for Divine Worship on Friday March 2nd 1866.When two sermons will be preached by the Rev. Peter MacKenzie of Gateshead at Half past two o’clock in the afternoon and six in the evening.Tea will be provided at Four O’Clock. Tickets 1/-each. On Sunday March 4th – Two sermons will be preached by the Rev. Joseph B.Dawson of Middleham. Services to commence at 2 O’Clock in the afternoon and six in the evening. On Sunday March 11th – Edward Brooke will preach at 2 O’Clock in the afternoon and six in the evening, and also on the following evening, Monday at Half past six. A collection will be made at each service in aid of the Building Fund. All went smoothly but Henry Lofthouse had his critics. In answer to their comments about “A Great Daft Roof” he would answer briefly “Its Gothic”. That shut them up, they didn’t know what it meant but it sounded impressive. The opening was reported in the Leeds Intelligencer in March 1866. 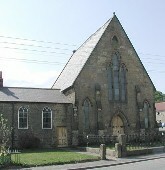 In 1870 There was a need for fund raising for the chapel. Report in Knaresborough Post July 1872. In 1888 the two cottages adjacent to the Chapel became vacant. At that time most Methodists were Liberals and they needed a place to hold political meetings. Very necessary in those days before Radio & TV and few National newspapers were seen in the village. They couldn’t use the Chapel. The day school was controlled by the vicar and school managers, all strong Conservatives, so no chance there. They acquired the 2 cottages and converted them into one large room. As well as a meeting place to discuss politics it was also to be used as a Sunday School. It was connected to the Chapel but it was controlled by a seperate trust who would have complete control of any activities. From then on it was always called the Chapel Schoolroom. Picture shows the Chapel Schoolroom. In 1915 a Millowner from Batley rented a house in Grewelthorpe to be used as his Country residence. His name was Fred Ineson. He was a Methodist and had great experience in Sunday School work. He was also very musical. As he was staying in the village every weekend he wanted to teach Sunday School. He was very good. But he was a typical Victorian authoritarian, a bossy man some would say, used to having his own way. He managed to offend the Sunday School Superintendant and the more elderly teachers.Things came to a head at the Sunday School Anniversary of 1916. He took full charge, he organised the services, had special hymn sheets printed with a photo of the chapel on the front cover. This was going too far! Meetings were held, what could be done to stop him?. Somebody remembered that the schoolroom was not Methodist Trust property. So the thing to do would be to persuade the Schoolroom trustees to refuse him access.The following Sunday when teacher and scholars arrived at the schoolroom they discovered they were locked out, they were locked out of the chapel also. The class was held in Mr Ineson’s house.The Trustees of the schoolroom were within their rights to lock the schoolroom but they had no authority to lock the chapel. Therefore on the next Sunday the class was held in the chapel. Of course there was tremendous ill feeling on all sides and many chapel members felt it was not in the spirit of Methodist teaching, and quarrels like this could not be tolerated. So in the end common sense prevailed. Not long after this Mr Ineson left Grewelthorpe and went to live in Kirkby Malzeard. Attempts were made to oust the Schoolroom trustees and get possession of the building for the chapel. This was not successful until 1936 when the property was conveyed to the Methodist Trust. In 1906 the old organ was removed and replaced with a newer model. 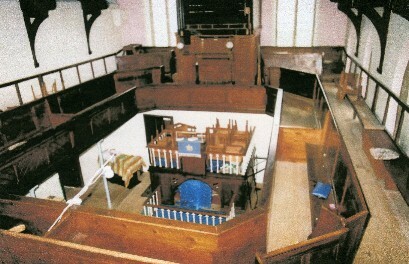 The original pulpit was removed and the rostrum as seen on the photo of the interior was installed.About this time a man called Robert Tomlin was living in the village and he attended the chapel. He was a building contractor and owned a business in Manchester. One Sunday he was in chapel. It was a very windy day and he feared the roof might give way. He said something should be done to strengthen it.The trustees engaged an architect. He reported that the roof was quite sound and not dangerous. But to make sure he advised fitting an iron bar across the principal near the organ. The Blacksmith was employed to make a bar and it was fitted across the chapel. The original heating in the chapel was a hot air system. By 1920 it was very inefficient. Smoke got into the air ducts so it was a choice of being smoked out or cold. In 1925 the stove was removed and a coke fired hot water central heating system installed. In 1932 Electric lights installed. In 1949 an electric organ blower added. In 1952 a modern toilet installed. In 1954/55 the extension to the schoolroom was built. In 1961 A new kitchen opened. In 1966 The old coke boiler was converted to oil. In 1981 A new oil fired boiler brought in. In 1982 additional radiators added. 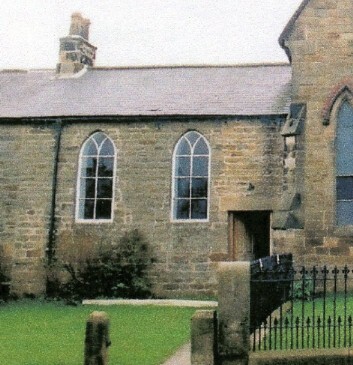 In 1986 The chapel and schoolroom were rewired. 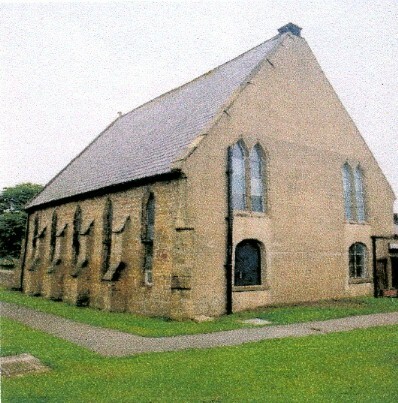 In 2004 Chapel closed and a covenant agreed between the Methodists and the Anglicans in Grewelthorpe to share services, buildings and mission.The wording of the covenant of March 2004. And now in 2006 what will become of the old chapel building? Currently a steering committee is working on converting the building into a community centre for the village. Plans are underway to sell off the chapel schoolroom and convert it back into housing. Watch this space. The above information was taken from the writings of Raymond Thirkill January 1988 and also old Parish Magazines. May 2012.Plans are well underway now for a village hall and community centre in the old chapel building. The schoolroom has been sold and converted back into a house. For more information about the new village hall see the page on this web site dedicated to it….You say. Families that George is related to include Cade, Thorpe, Wilson, Readman and maybe Thirkill. Anyone who would like to contact George please contact B. Bradley at the above e-mail address. Letter from Deon Morlock in April 2012. I have been to Grewelthorpe a few times. It is such a lovely place and I can still see it in my mind. The majority of my family lived at Kirkby Malzeard and Dallowgill. I read the information and history on the Methodist church and I do have a question. It stated that the church was open for worship in 1866. It also states there was an older chapel first with 11 members in 1795, then a small chapel was there in 1803. Are any of the records available with information on the members? I have Lofthouse people, which were involved [my maiden name]. I am also interested in any possible entries for a Anthony Mann and Frances nee Lofthouse family in the 1840“s. I tried to see if there were any records available at the record office in Northallerton, but I could not see anything listed for Grewelthorpe Methodists. If you can help Deon please email Barbara Bradley at link mentioned above.